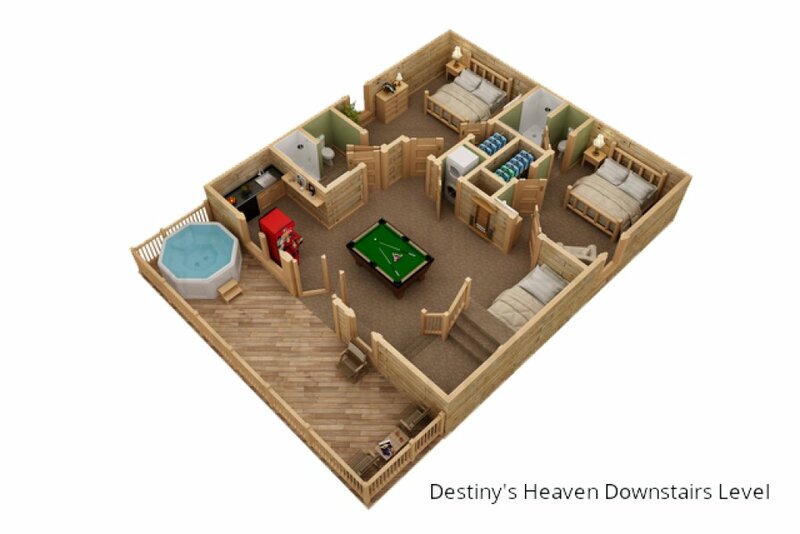 With five en-suite master bedrooms spread out among its three floors, Destiny’s Heavenly View is ideal for a multifamily vacation, several couples traveling together, or a reunion of family and friends. 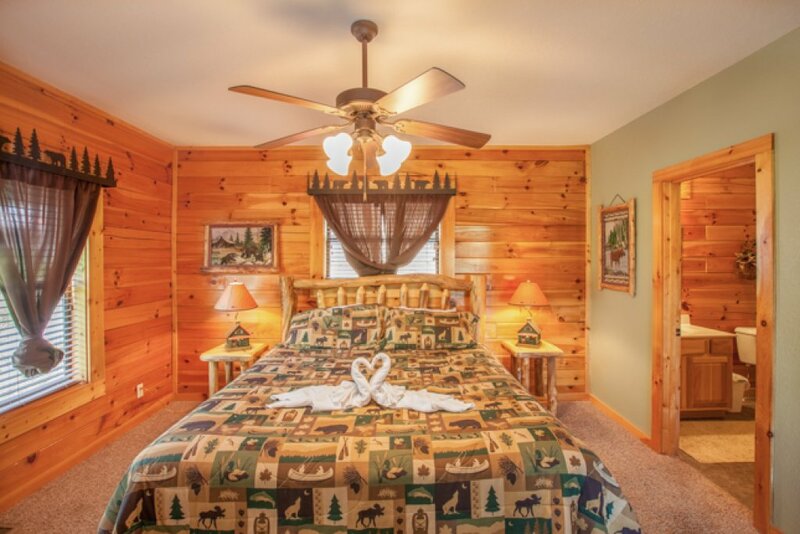 Along with plenty of rooms offering privacy, it features large gathering spots, including two spacious decks and a game room complete with pool table and multi-game arcade. 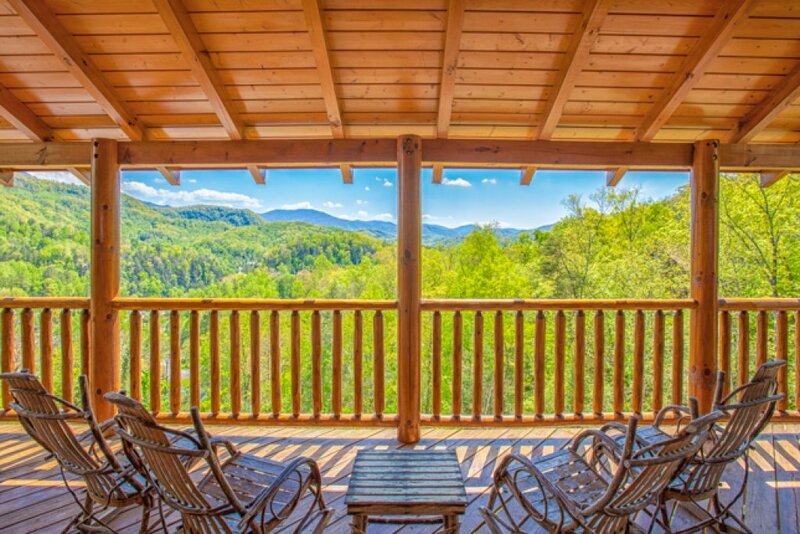 Located midway up a hill, Destiny’s Heavenly View looks out over old-growth woodlands toward the Great Smoky Mountains and downtown Gatlinburg; you can even see the Space Needle from the decks. 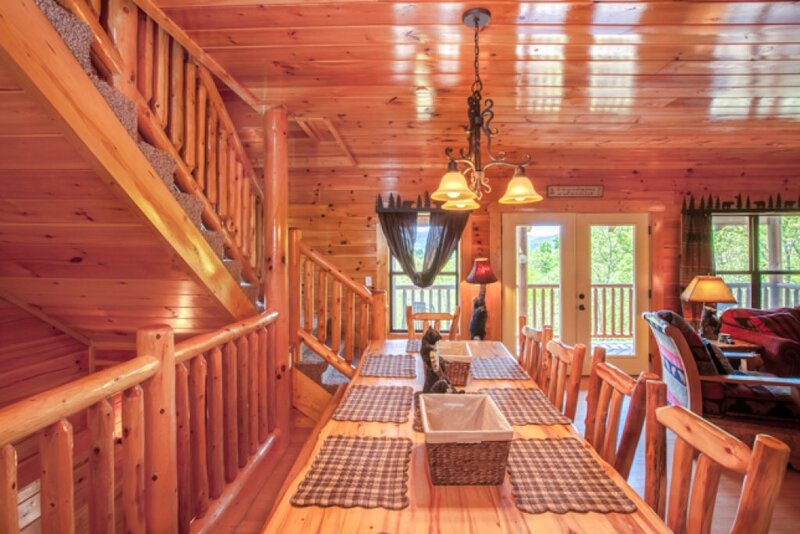 The cabin is just two miles from the parkway, home to restaurants, thrill rides, an aquarium, the Guinness World Records Museum, and a tram that will lift you over the town to Ober Gatlinburg Ski Area and Amusement Park. 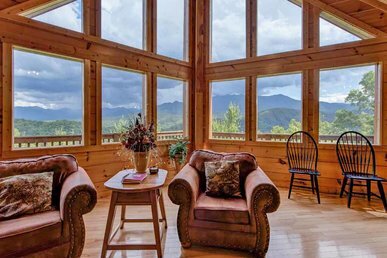 It’s also just a short drive to the Great Smoky Mountains National Park, which you can explore on foot, by bike, on horseback, or by car. Yet when you stay here you’ll feel blissfully removed from the hubbub. 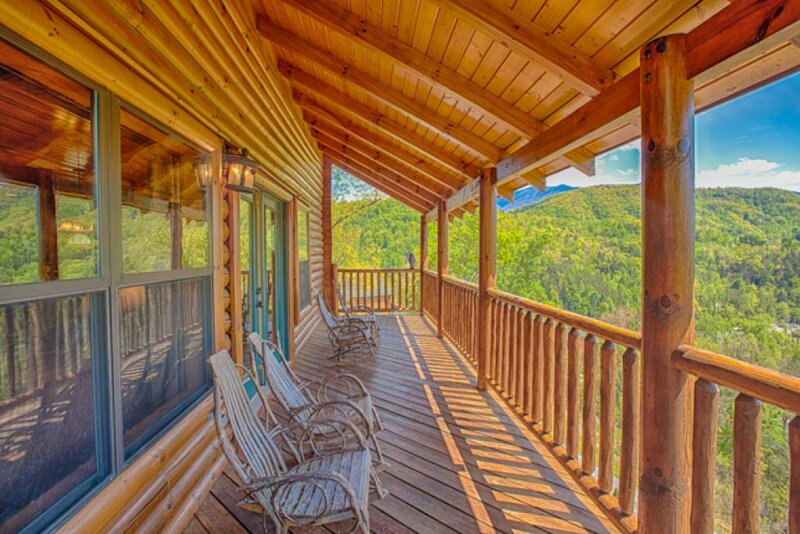 The two covered decks, which span the width of Destiny’s Heavenly View, are furnished with plenty of rocking chairs so that you can kick back and revel in the crisp breeze, the singing of sparrows and chickadees, and of course, the sight of the mountains. 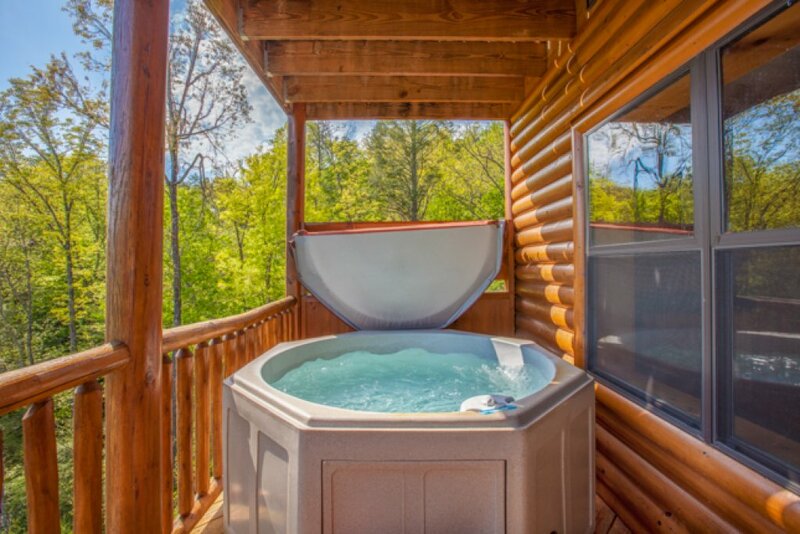 The lower deck has a hot tub as well. Soaking among its bubbling waters beneath the star-studded night sky is nothing short of glorious. 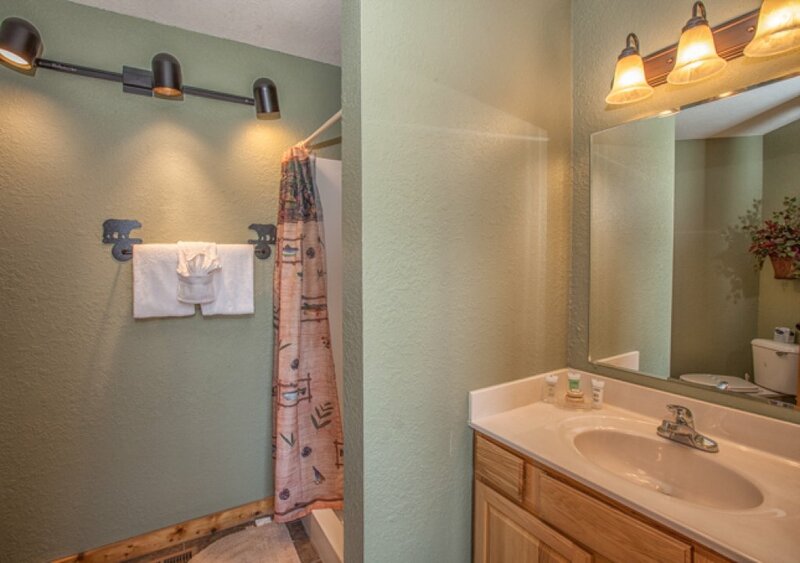 If you prefer to soak indoors, you’ll be happy to know that three of the five bedrooms have their own jetted tub. No matter how weary your muscles are after a day of skiing, hiking, or white-water rafting, a lazy bath will reinvigorate them and have you rarin’ to go again. 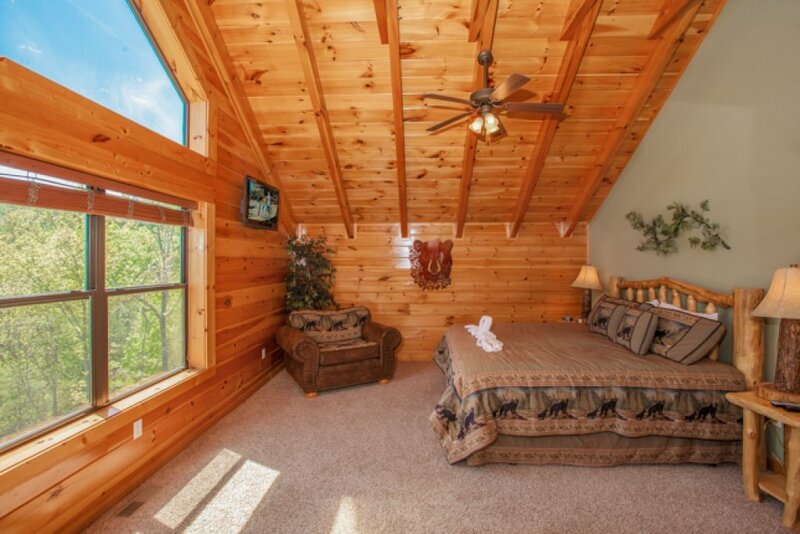 All five bedrooms are rejuvenating retreats. 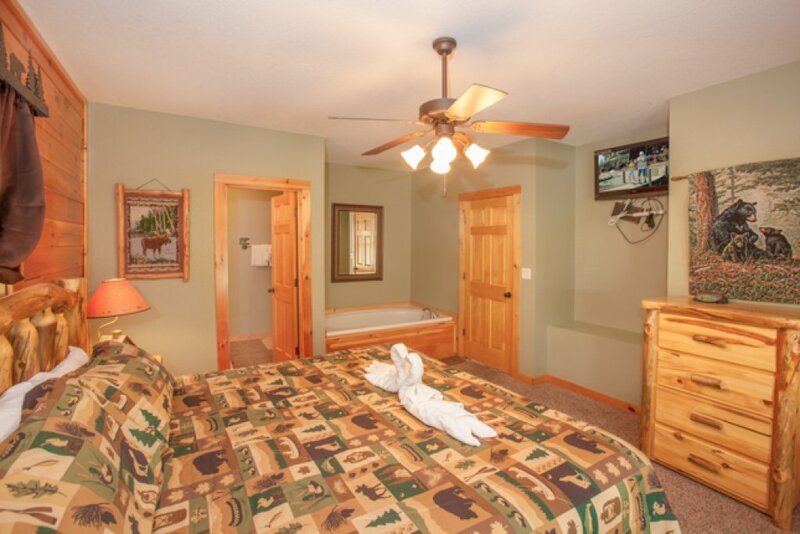 Each includes a king-size bed, a flat-panel TV, and a private bathroom. The two suites that make up the loft level are especially luxurious, with high cathedral ceilings and a wealth of floor space in addition to private jetted tubs. 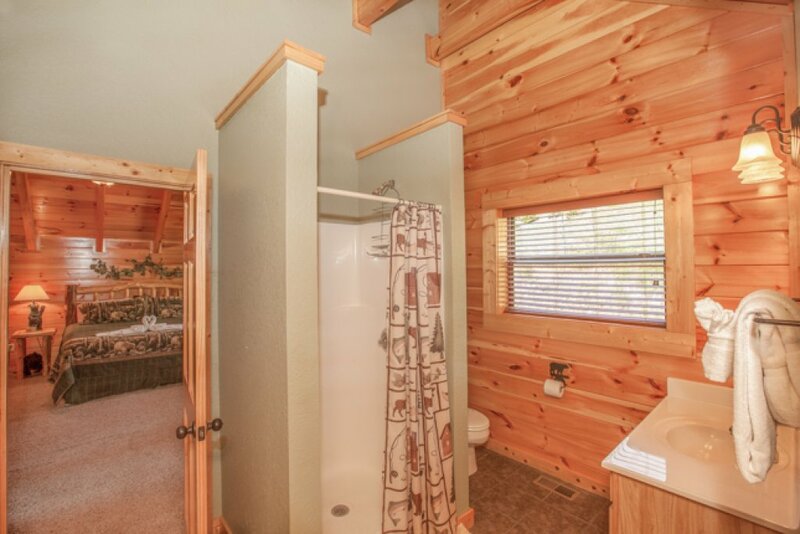 The bedroom on the main floor has a jetted tub as well. 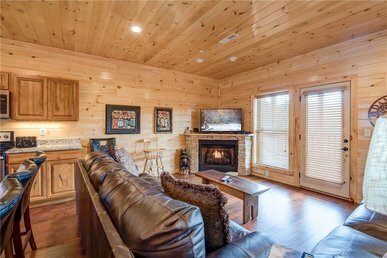 While the two downstairs bedrooms lack that luxury, they’re still marvelously restful spaces, with log style furnishings, king-size beds, and private bathrooms. One of these bedrooms includes a sleeper sofa perfect for little ones. If you need additional beds, one of the great room’s sofas converts to a queen-size bed. There’s even a sleeping nook in the downstairs game room, though if you bring Fide and Fluffy (Destiny’s Heavenly View is pet-friendly! ), they might want to make that cozy space their quarters. 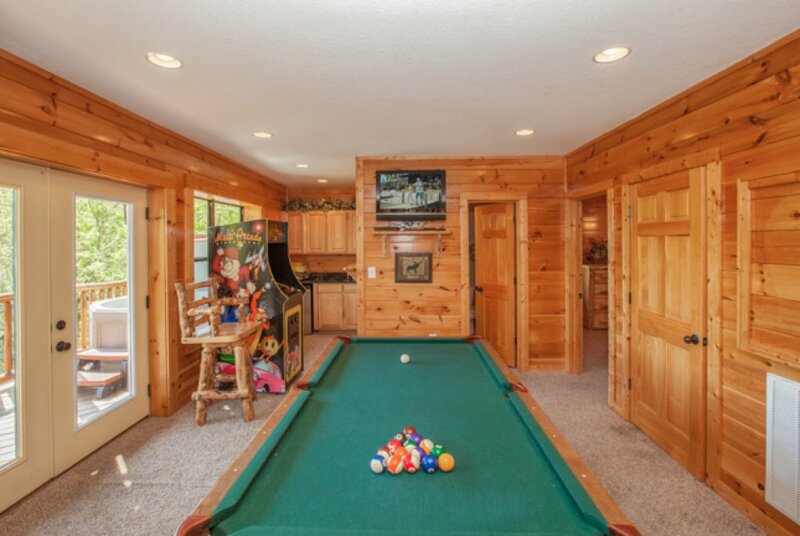 Along with the sleeping nook, the game room features a full-size pool table, a multi-game arcade, and a flat-screen TV. There’s a wet bar too, so you don’t have to run upstairs for a drink and a snack while you’re in the middle of a close game. 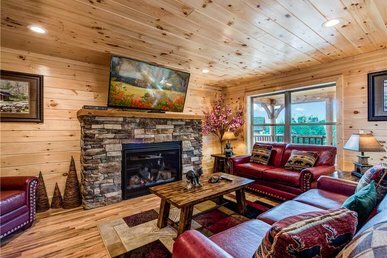 The great room on the main floor has yet another flat-screen TV along with generously cushioned seating certain to make this a favorite gathering space. The stacked-stone fireplace adds to the inviting ambiance, especially on a chilly winter’s night. The great room’s dining table seats ten people, and the adjacent kitchen is equipped to feed a small crowd. Along with stainless-steel appliances (including a dishwasher), it includes plenty of pots, pans, gadgets, tableware, and gleaming granite counter space. 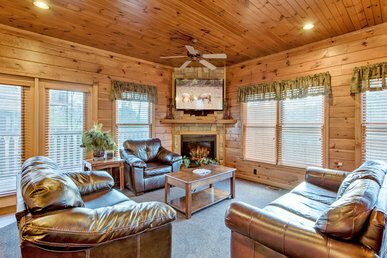 The cabin’s other amenities include free WiFi, cable channels, and a washer and dryer; won’t it be great to return home from a vacation with clean clothing for a change? 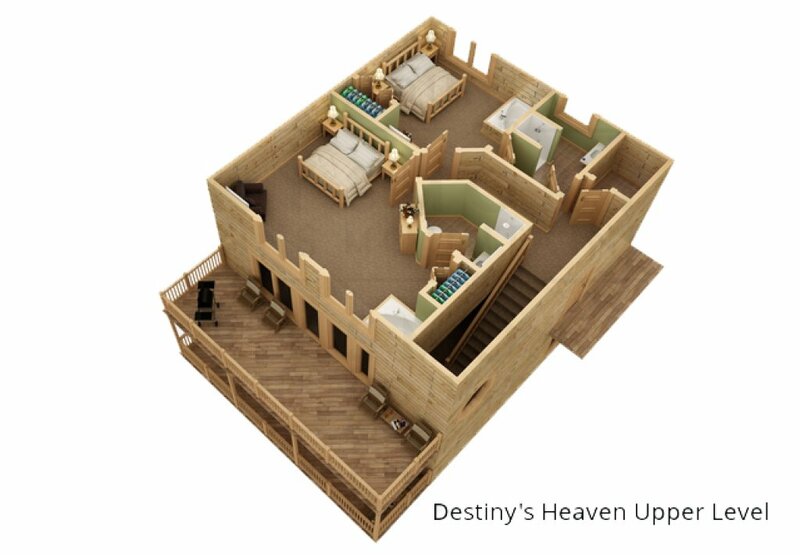 When you stay at Destiny’s Heavenly View, you’ll feel as if you’re in a private paradise—and that’s a wonderful feeling! So book your stay today. We’re looking forward to seeing you. 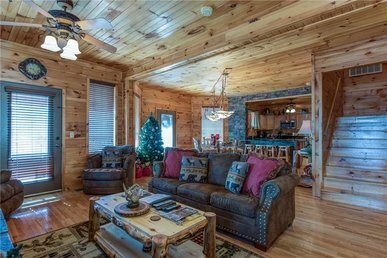 10 members of my family stayed at the "Destiny's Cabin". It was a great week with a beautiful view of the mountains. We enjoyed Cades Cove and the beauty of the fall colors. I liked that each of the 5 bedrooms had king beds and a bathroom. The beds were very comfortable. While the kitchen had plenty of cups, glasses, and plates, it didn't have any skillets and the garbage disposal didn't work. 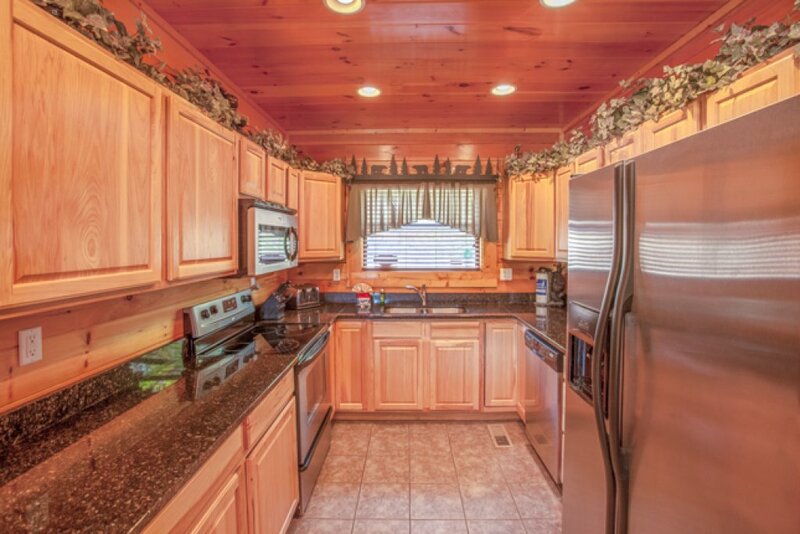 The were some issues with cleaning -the kitchen needed mopped and the game room needed vacuumed. Several of the blankets pulled from the closets needed to be washed before we could use them. One of the garden tubs had black "stuff" that came out of the jets in the tub. 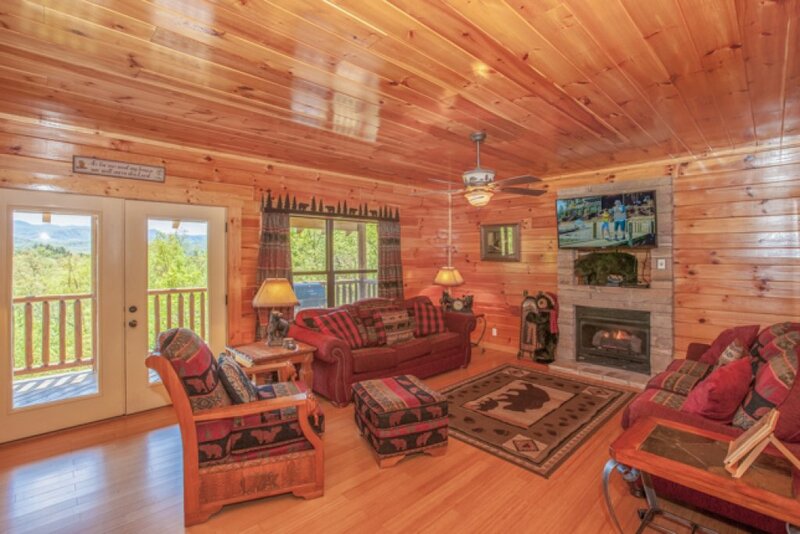 The cabin also needed a few more chairs on the deck as well. The issues mentioned weren't bad enough to ruin our beautiful week, but more of a an inconvenience. Thanks for the review and your honest feedback. I apologize that the cleaning fell short of your expectations - I wish you had contacted us while you were here so we could have addressed these issues. We will ensure that this doesn't impact future guests. Come back soon! Cabin was awesome...just as described on the website. 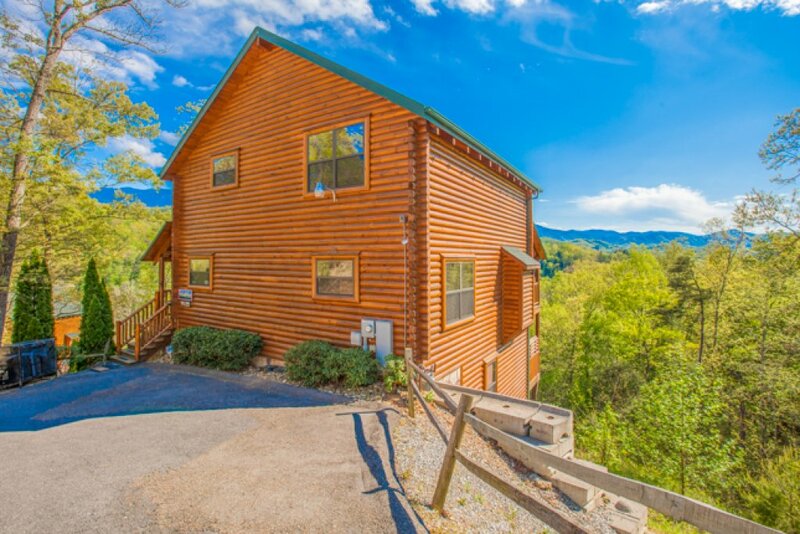 Location of the cabin is perfect...not to far up the mountain and not far from the main road and Gatlinburg. We would highly recommend this to friends and family. 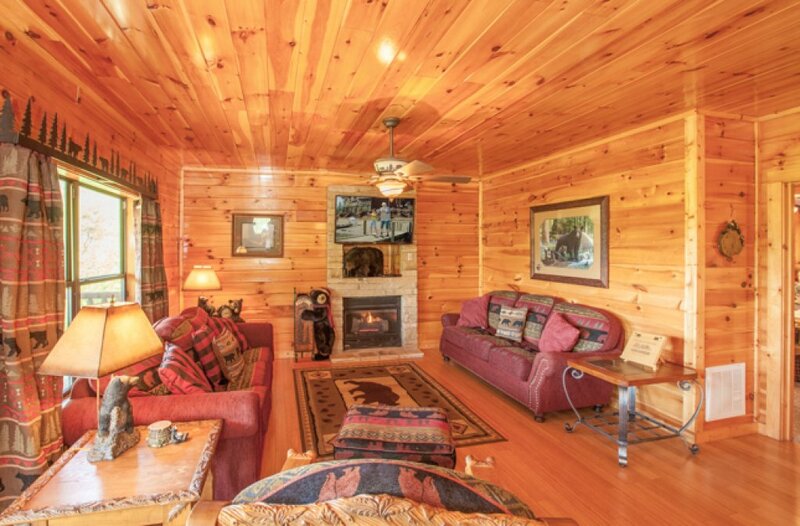 This was a very nice cabin. Well equipped and perfect size for our family of 14. However, it was advertised to have a full-sized crib, which wasn't there. Instead, baby had a pack n' play. It worked, but the crib was a really big selling feature. We didn't see anything on our list of instructions regarding trash pick up. You might want to consider adding to the instructions to call for pick up. Otherwise, everything was very nice and we would love to stay there again in the future. 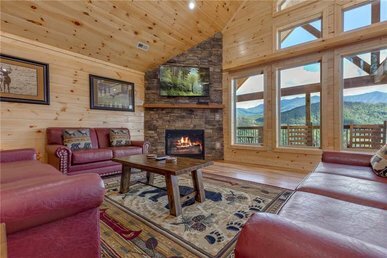 I would highly recommend this cabin to family and friends! MANY, MANY cleanliness and maintenance issues. Dirty dishes behind bedside tables, broken coffeepot and utensils, poor selection of dishes/utensil only 2 wine glasses and only cheap plastic glasses- not enough for # of people it could sleep, spatulas unusable, frying pan- non stick surface gone everything sticks , doors stick and squeak, dirty black fingerprints on doors, place mats crusty and sticking to table, blankets dirty, carpets filthy, broken uneven tile at top of steps, all blinds loaded with dust, difficult to lock trash, clock radios non functioning, lamp in bedroom main floor has no knob-could not turn on, would be nice to have ceiling fans on balconies, fireplace did not work even though it was after labor day, toaster missing knob, microwave light does not work, nosy ceiling fan in lower level bedroom., trash under beds- overall a very disappointing property. 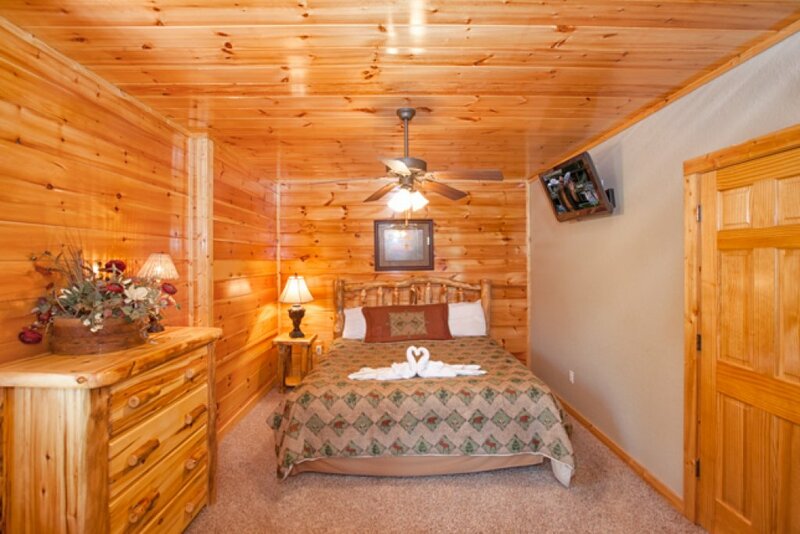 Thank you for your review of Destiny's Heaven and your recent stay here in the Smoky Mountains. 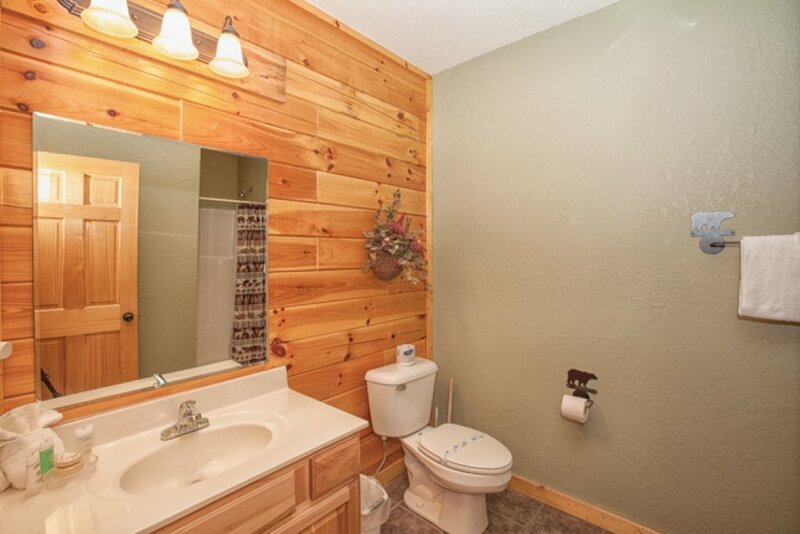 I am VERY disappointed that you chose to give this beautiful property a one-star review without ever having contacted us regarding the complaints. I wish you had contacted us on the 24/7 guest hotline sow e could have addressed any/all issues in a timely manner and provide you with an exceptional vacation experience. Based on your feedback, we have discussed the issues with the team and will ensure all items are brought up to speed. Thank you and come back soon. We met up in Gatlinburg with my entire family for the first family vacation in ten years. It was so beautiful, from the cabin to the view. 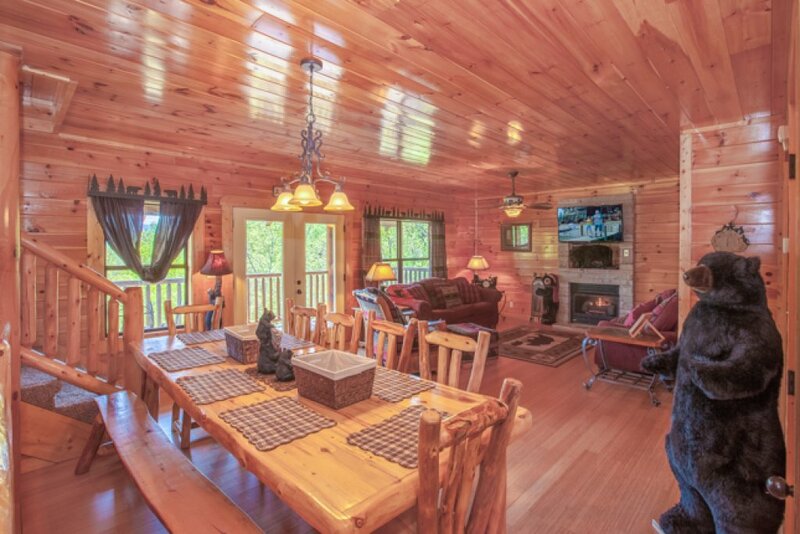 We had a wonderful time and would highly recommend this cabin to others. Great views at Destiny's Heaven! 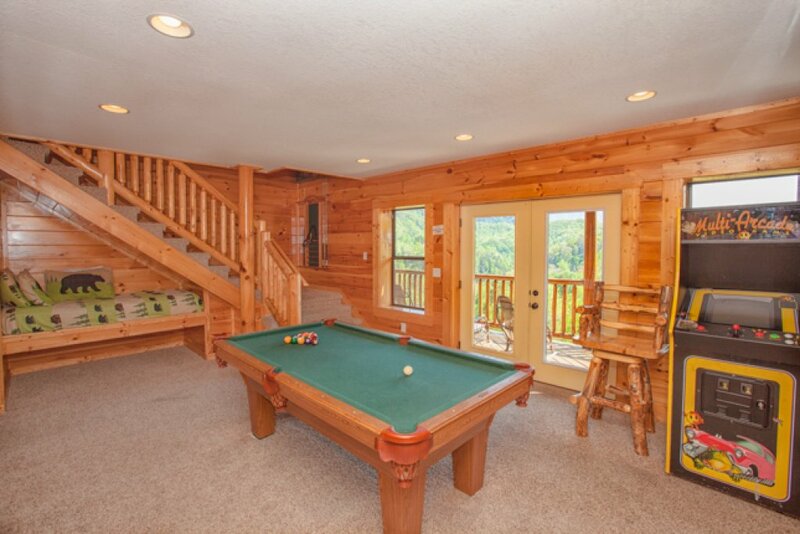 The house was perfect for our 2 families vacationing together. Plenty space to hangout together and quiet places if you needed alone time too! Breath taking views from the decks. A short ride to all there is to do in the area- tons to do and see! 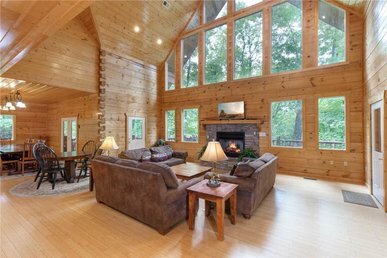 Would only worry about getting up the hill and turns in bad weather... Would recommend this house to anyone looking to visit East Tennessee! Loved the house. The view is phenomenal. 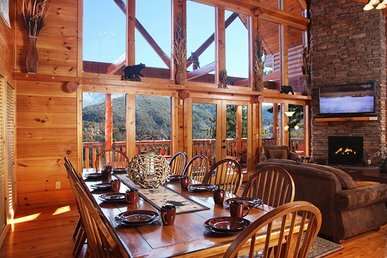 The house has everything that a family needs for a great vacation. We had a family reunion at Destiny's Heaven. There were four families, and 5 children. The three-story layout was perfect. People who wanted quiet took the top floor, more active folks took the ground floor where the rec room was. 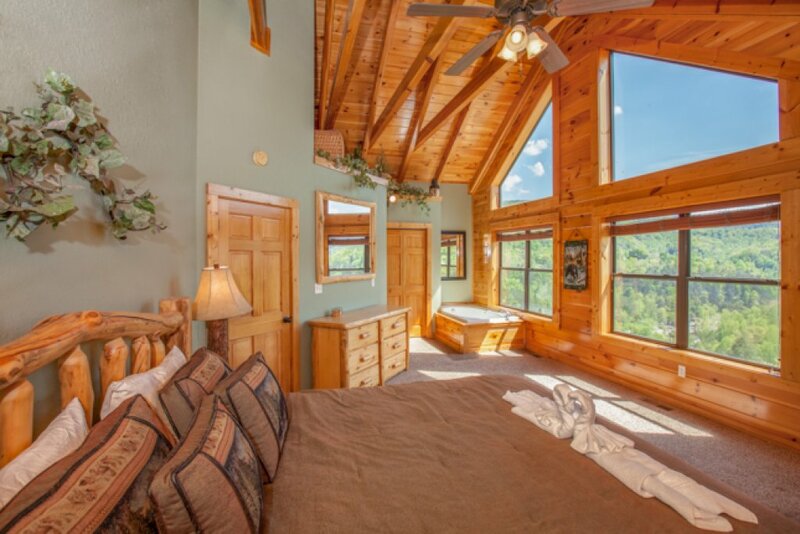 5 Bedrooms, all with king size beds and private bathrooms. It was wonderful! The setting, partway up a mountain, was breathtaking. The cabin was beautifully maintained. 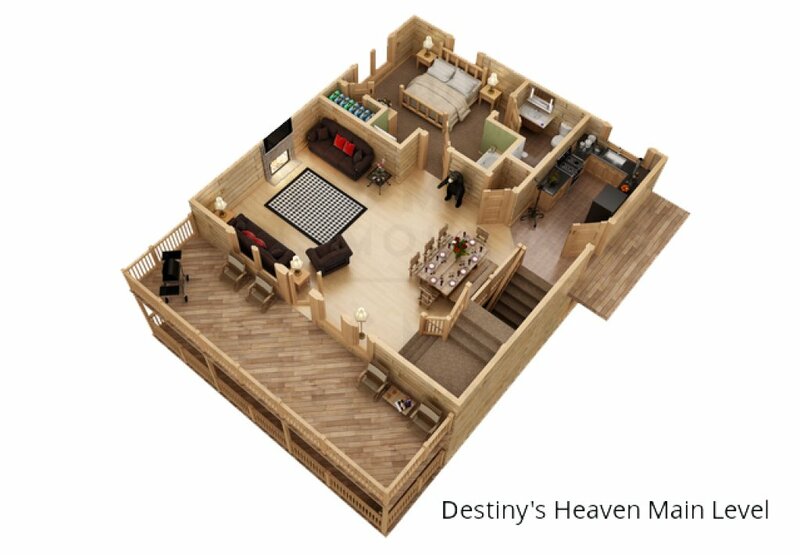 We would like to go to Destiny's Heaven every year! And not to forget the arcade game! A Big Hit! Wonderful accommodations and view from the house. We enjoyed a fun week for our family reunion (8 adults, 7 kids ranging from 18 months to 12 years). There was plenty of space for all of us. The kids enjoyed the arcade game and the pool table. The location is great. 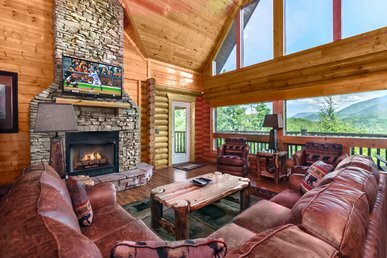 Up on the hill, it feels like you are away from the busyness of Gatlinburg, but you are close enough to visit Gatlinburg, Pigeon Forge, and the national park. We had a great time and would definitely recommend this place!